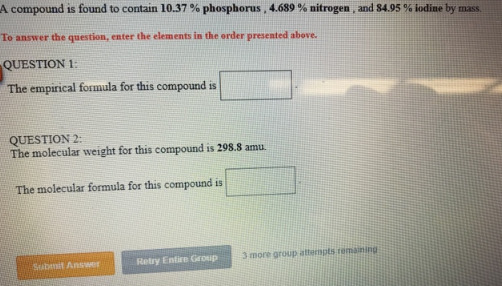 Solution: A compound is found to contain 10.37% phosphorus, 4.689% nitrogen , and 84.95% iodine by mass. To answer the question, enter the elements in the order presented above. QUESTION 1:The empirical formula for this compound is ___________.QUESTION 2:The molecular weight for this compound is 298.8 amu. The molecular formula for this compound is ___________. A compound is found to contain 10.37% phosphorus, 4.689% nitrogen , and 84.95% iodine by mass. The empirical formula for this compound is ___________. The molecular weight for this compound is 298.8 amu. The molecular formula for this compound is ___________.